YOUTUBE IS A POWERFUL PLATFORM AND TOOL FOR JOURNALISTS. NEWS publishers can use YouTube to grow audiences, engage with viewers and find and curate citizen-created videos. Ben is already using YouTube, but the following platform strategies will help inform goals for his organization’s YouTube channel. GROW YOUR AUDIENCE. The most powerful argument for building a YouTube channel is audience aggregation. More than 1 billion unique users visit YouTube each month. Fifty-one percent of U.S. adults watch YouTube videos, and one-fifth of those users watch news videos specifically. 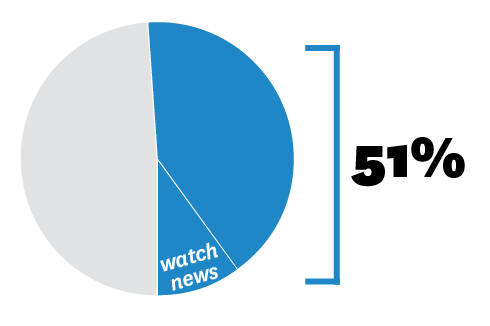 That’s 10 percent of the adult population that uses YouTube for news. The stats get even more impressive for target demographics that are a bit younger. Nine out of ten 18-to-29-year-olds watch online videos, and almost half of those--48 percent—watch online news videos, Pew Research Center reports. That’s 24.5 million Millennials. As a news organization looks to attract new audiences, YouTube is a great place to start. Ben is impressed. That’s a lot of people! He knows it’s important for his publication to continue to attract new audiences, and YouTube is a great audience aggregator. AUDIENCE ENGAGEMENT. YouTube is the second largest search engine in the world after Google, which creates many opportunities for substantive engagement with new audiences. News organizations can create a bond with subscribers as viewers share and engage with their content. Viewers can SUBSCRIBE to channels they like; videos from these channels appear in “What to Watch” and “My Subscriptions” sections of YouTube. A YouTube channel is INTERACTIVE; viewers can ask questions of the news organization and get cogent responses to their questions in videos themselves or in the comments section. YouTube audiences SHARE videos they like rather than passively consuming; it’s a social media platform at its core, so sharing is an integral part of a YouTube user’s experience. Viewers can ADD videos to playlists. Like and Dislike buttons indicate viewer SATISFACTION. BREAKING NEWS is a great opportunity to capture YouTube’s search traffic. Use the YouTube PLAYLIST FUNCTION to show a story’s evolution, creating video updates and demonstrating responsible reporting as the details of a story change and context becomes clear. YouTube also offers LIVESTREAM capability via Google+ Hangouts On Air if a channel wants to broadcast live video. A YOUTUBE CHANNEL is an additional vehicle for discovery of your website or platform. YouTube allows channels to drive traffic back to an associated website, exposing new audiences to your work. Hmm…YouTube is a great place to build the “know, like, and trust” relationship with our audience, Ben thinks. He’s interested in using playlists to track a story and is looking forward to interacting with his organization’s emerging audience. CURATE CITIZEN-CREATED VIDEOS. YouTube plays a role in many significant news stories as a repository for evidence. Amnesty International has built a toolkit called the Citizen Evidence Lab to help journalists authenticate YouTube videos. A YouTube channel allows a publisher to guide a viewer through the primary evidence of a story by playlisting citizens’ videos or on-the-ground reporting. Interstitials, which are short video segments that act as connective tissue between each video, allow the news organization to contextualize each clip and add substantive reporting to the playlist. Ben wants to use YouTube to curate citizen videos during election season on the campaign trail. He is planning a different playlist for each candidate; the playlists will show citizen-captured video from campaign stops to provide “boots-on-the-ground” coverage that his organization wouldn’t ordinarily have the resources to execute. GENERATE REVENUE. YouTube is the only major social media platform that allows content creators to generate revenue. The YouTube Partner Program distributes advertising revenue based on watch time, viewership and audience retention. YouTube takes a 45 percent cut of channel revenue and this high percentage has been the subject of much debate. However, the revenue distribution allows channels to create YouTube-specific video content and recoup some production costs. Ben thinks, Great! We already create platform-specific content for both Twitter and Facebook, but don’t see any direct financial return.